Please forgive an old trapper this melancholic flashback. But one of the most inspiring projects during my career was the successful migration of a business publication from print to online around the turn of the millennium. “Inside-Lifescience” was a multi-channel online-magazine covering latest news and trends in life science, pharma and biotechnology. But let’s start with the roots. The publication was originally developed in early 1999 by a leading German publisher of specialized journals in the fields of life sciences/medicine and the information broker business that I had just founded. 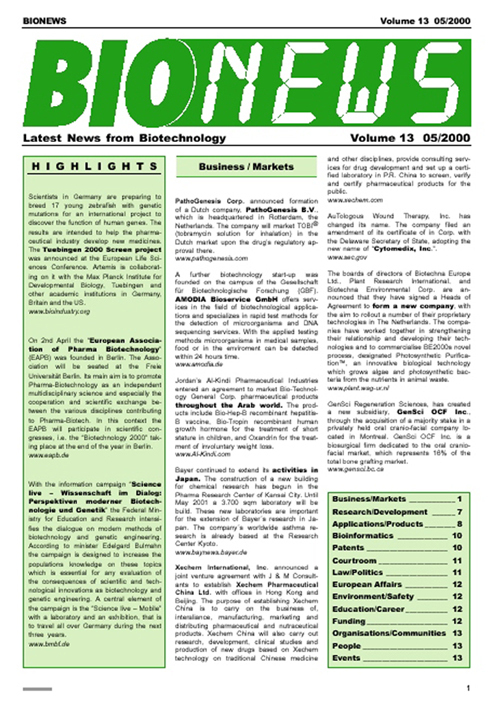 The intention of the publisher was to establish a periodical information resource that reflected the emerging European biotechnology industry. We – with our know-how of information research combined with in-depth knowledge of life science technologies and industry – were found to be the right content partner for this project. The result of both expertises was the printed monthly newsletter “BIONEWS”. “BIONEWS” mainly included news from all over the world arranged in categories. This was complemented by an event calendar, links to web sources, and an editorial. 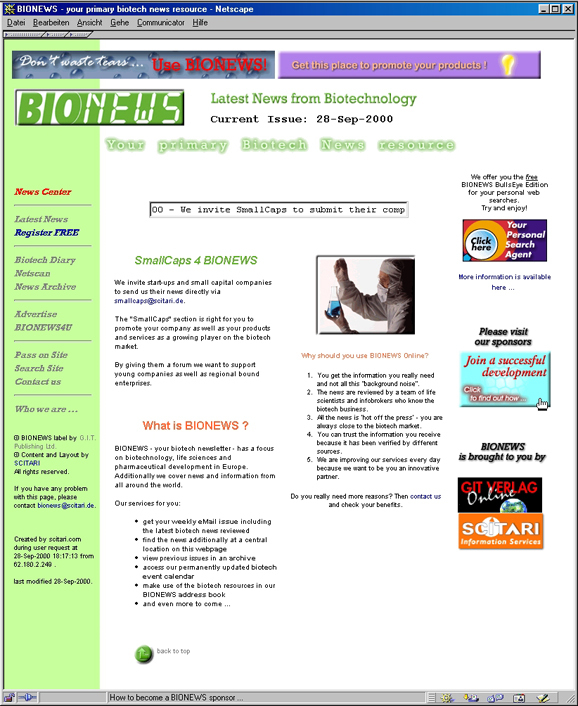 “BIONEWS” contained no advertisement and was exclusively financed by subscriptions. As the aim of “BIONEWS” had always been to cover current trends and to be most up-to-date, we soon realized that a print publication had natural limits regarding timeliness. With the monthly frequency, the news for a single issue had been collected over a couple of weeks. Layout, setting, print, and delivery needed at least an additional week. So, at the time the reader had his copy in his hands, some news were already four or even more weeks old. Not really highly topical! The only way for a print publication to overcome this limitation would had been to shorten its publication dates. But this also would had multiplied the operating efforts and costs. As a result the whole production process from initial content research up to the archives was improved … resulting in a new product and new services at lower costs. But lower running costs had to be paid with great set-up expenses. As the print version could be produced via the standard production path of the publisher, the online version needed a complete new infrastructure. We found this structure in an information management system that was able to channel incoming as well as outgoing information, and allowed to automatically publish content on the web. This system also could automatically mail electronic newsletters, send SMS messages, and fill WAP pages in parallel to the HTML pages (for generation Y: WAP was an early technology to make web pages visible on mobile devices with – at those times – minimalistic displays). Further technical problems had to be solved. “Inside-Lifescience”, the new name for the publication, needed a web server, and a reader-oriented web layout had to be developed. Setting up a new information system did not only have a technical perspective but also psychological aspects. Established working behaviour needs to be changed. System users (the editorial staff, e.g.) needed to get an introduction to the new software. The internal “routing” of information was changed. More information has to be shared internally. And I am sure all of you know the sentence “But we have always done it by this, and it always worked fine!” But I was lucky to have a quite young team showing the flexibility that was necessary to successfully manage those changes. The publisher now took the marketing part of the project. They had been an established professional marketing partner within the life science industry. They did have the contacts to sell banner places as well as corresponding “Inside-Lifescience” enterprise products (like content delivery for company web sites, e.g.). But they also had to learn, because selling an online banner is not the same as selling advertising space in print journals. So, the project was a challenging and exciting experience for both partners. At those times, somehow comparable to the joint exploration of a new continent. One important aspect should not be forgotten, as it is still prevailing. Despite all the new media euphoria we did not want to close our eyes for reality. In those early times, only a few online journals and information portals were substantially in financial plus. Online publishing was not really established in means of the return of investment. One reason may had been that internet users were used to have information and content for free, and many people did not really acknowledge the value of high-quality information (to my opinion this has not really changed so far). Back then I was convinced that there was only one promising strategy to earn the money needed for the maintenance of an online information service: by accompanying products and co-operations. The few financially sound online projects, like “Focus Online” in Germany, showed that this was the way to success at that time. “Inside-Lifescience” had at this point already an advantage because it naturally cooperated with a variety of print journals that were under the roof of the publishing partner already. Finally, “Inside-Lifescience” started real multi-channel with a web-magazine, an email newsletter, a mobile edition, an AvantGo-channel (at those times for PDAs), and an SMS alert service. And most important … with exciting, interesting, relevant and up-to-date quality content. We offered an always up-to-day view on the biotechnology industry, and had external industry insiders providing editorials. “Inside-Lifescience” lived as a successful online magazine with thousands of readers for a couple of years. It was discontinued when the collaboration ended due to a takeover of the publishing partner. We kept the online platform for a few more years as our corporate publication for clients and stakeholders, resulting in some major project acquisitions. But this is another story.